Dig-dabity-nab. Dang it. I deleted a love letter to my daughter. Thankfully I texted it to her already, but I wanted to record it for posterity. Sigh. Texting her from 3,000 miles away I chuckled at her youthful naivety and assured her I would be anything but as she would see, and I proceeded to list qualities to my daughter that I felt encapsulated my little deer. 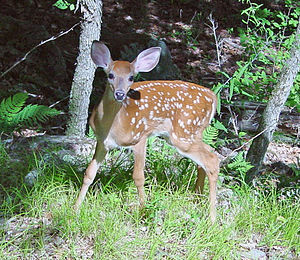 I say little deer because she has always resembled a fawn to her father and me. Remarkably she said a few people in her high school told her the same thing. To me, that is her inside skittishness shining through. You are heartbreakingly sweet, and you hide it. You are quick with a comeback and smart when you want to be. Mean as a snake when you feel pushed against a wall. You have a poetic sensibility. One word – “Yes.” Then again the deer runs into the forest. She now lives across the country in California, I live in North Carolina. When she was at home our screaming matches sometimes reached baseball stadium decibel proportions. I think the Bobcats, our local basketball team that seems to lose a lot might want to hire me for their cheering section. Easily my screams could drown out the other team’s cheering section, although I’d probably smother the sound of sirens as well which would create a safety hazard. I mean, you name it I have done it. Well, OK, not anything illegal but you get my drift. So when my daughter said “You’ll just be mean” when I asked if she wanted to know what I thought of her, her reticence to hear might have had a shard of truth. Maybe I yelled too much? Too critical? I’m told this by both of my children. “You’re critical all the time, Mom!” my son or daughter will say. I am aware I have this flaw. (It’s so minor really, if you keep turning the mirror it practically disappears.) I’m sort of mean to myself sometimes so I know my tendency would be to be mean to others. But geez. I mean really, what do they know? They’re just teenagers. Just children. A couple of babies, really. Sigh.